Image: A pony stallion on the Gili Island named Jerry. The Gili Islands, a growing tourist destination, lie just off the coast off Bali. Part of their appeal lies in the fact that there is no motorised transport. 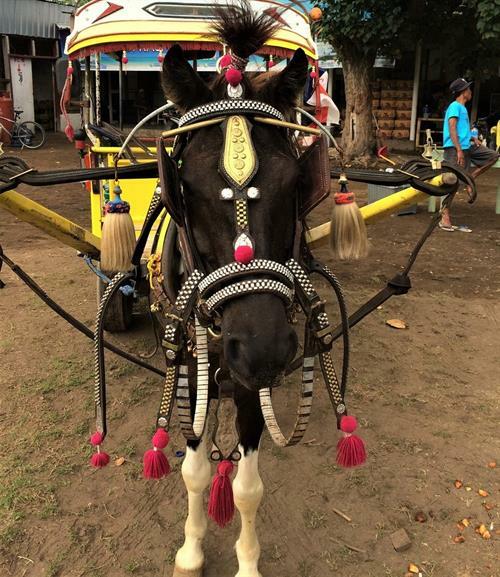 Instead, a remarkable plucky group of horses known as the Gili Island Ponies work very hard to provide essential transport for people, supplies, and large loads of rubbish! Given their small stature, their efforts in the tropical conditions and terrain are nothing short of heroic. With little local veterinary services available, several charitable groups have banded to organise the services of dedicated Australian veterinarian and farriers. Veterinary clinics have been set up to now enable local access to specialised dental, medical and farriery services. 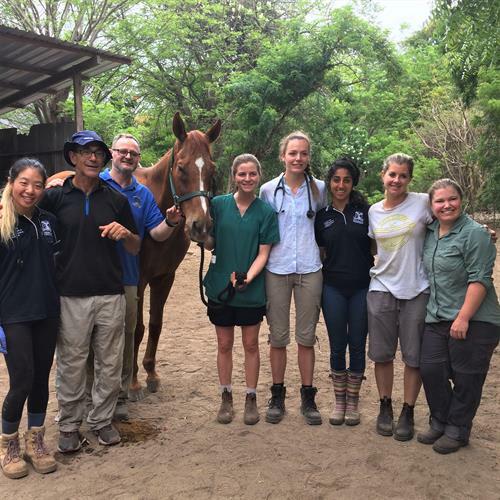 Last November, a keen group of six students, a clinician and a specialist anaesthetist from the University of Melbourne’s Faculty of Veterinary and Agricultural Sciences joined forces with Dental Vet’s Dr Kirsten Jackson and a team also from Western Australia to assist in these efforts. Despite volcanic issues, the team of 23 flew to Bali together with other farriers, equine dentists and even a leather worker. Their mission was to not only treat, but also put in place preventative health measures for these wonderful ponies. Dr Thierry Beths from U-Vet Werribee Animal Hospital and Dr Charlie El-Hage, an equine clinician and veterinary biosciences academic at The University of Melbourne, were part of the team to assist with a wide range of procedures on a long queue of ponies in a week – there were over 200! Among the ponies treated was Dennis who had come in with an allergic skin condition most likely due to insect bites. After several days of regular medicated washes, anti inflammatory and salt water bathing (his driver kindly took him swimming in the ocean), he was all and much more comfortable to return to his duties. 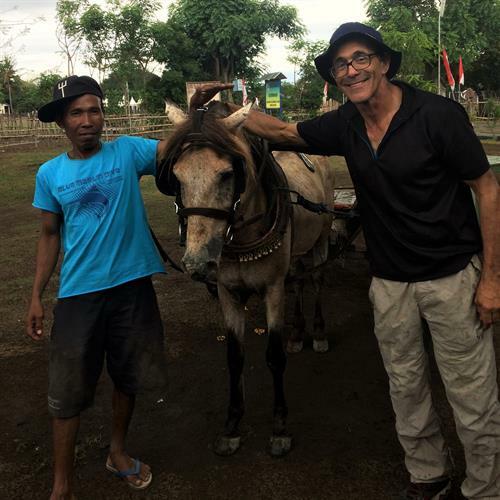 Image: Dennis' owner and Dennis the pony with Dr Charles El-Hage. Jerry (the pony stallion in the cover image) required daily wound flushing, debridement and medication. After four days of treatment, Jerry was back to his cheeky self. Image: Jerry back to his cheeky self with Dr Charles El-Hage. If it were not for the capable of assistance provided by the six University of Melbourne veterinary students, they simply would not have been able to treat all the ponies. The final-year Doctor of Veterinary Medicine students, Sanjana Aswani, Holly Lambert, Kate Tasker, Olivia-Lee Sullivan, Jess Noto and Katelin McLarney, enthusiastically performed dentistry, provided medical treatments and assisted with many procedures under often extreme tropical climatic conditions. Jinski the horse with The University of Melbourne students, Dr Thierry Beths and Dr Charles El-Hage. 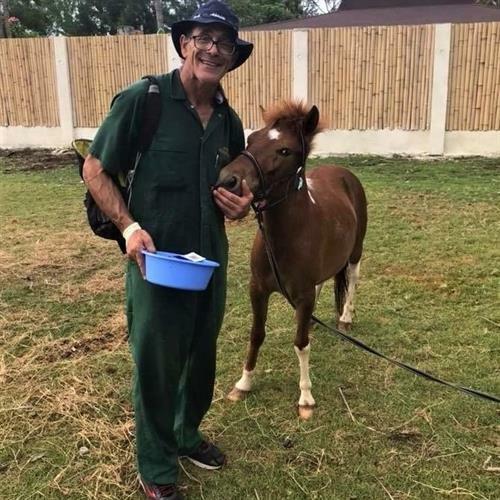 It is with the hope that students and staff from the University of Melbourne’s Faculty of Veterinary and Agricultural Sciences can assist local veterinarians and veterinary students to aid the animal welfare efforts in the Gili Islands and eventually provide ongoing sustainable veterinary care for these brave ponies. Acknowledgments to Animal Aid Abroad and Dr Kirsten Jackson (Dental Vet), and many local organisations including Gili Eco Trust, Blue Water Express, Trawangan Dive, Blue Marlin, Lutwala Dive, Pesona Resort, Cats of Gili, Dr Slade Walker, Kelvin Grove Equine and Grant Forge & Farriery . For more information about our services and to make an appointment, contact us.